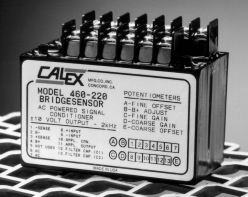 The Model 460 Bridgesensor is a self contained, AC powered, signal conditioning module for bridge type instrumentation. It contains a precision differential instrumentation amplifier with filtered output and a highly regulated, low noise, adjustable output bridge excitation source. The unit is completely encapsulated for use in rugged environments. The output filter cutoff frequency is 2000Hz and may be lowered by adding two external capacitors. Features ! 2 kHz Frequency Response ! Rugged, Compact And Fully Encapsulated ! Complete System-just Add AC Power ! Ready To Use With Screwdriver Wiring ! Stable and Accurate.